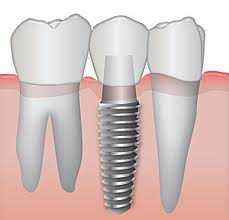 An implant acts as a substitute for the root of your missing tooth which then bonds to the bone in your mouth. These fixtures form a foundation for a replacement tooth that looks and feels just like your natural teeth. Implants have quickly become the most preferred method of tooth replacement. There are numerous advantages of dental implant treatment over traditional treatment options. For instance, it is not necessary to grind down the bordering or adjacent teeth for a bridge, or secure a partial denture to them with clasps that might eventually loosen the natural teeth. By utilizing these root substitutes made from safe titanium, people who are missing teeth may be spared the many problems associated with traditional removable dentures. When a tooth is lost, it is normal for the jaw ridge to shrink leaving a defect. Implanted fixtures actually help preserve the gum ridge and jaw bone density by providing the stimulation that was previously provided by the natural tooth roots. This helps maintain the integrity of your facial structures as you age.